I'm not really sure what to call this post. Here's the deal, it's prom season. 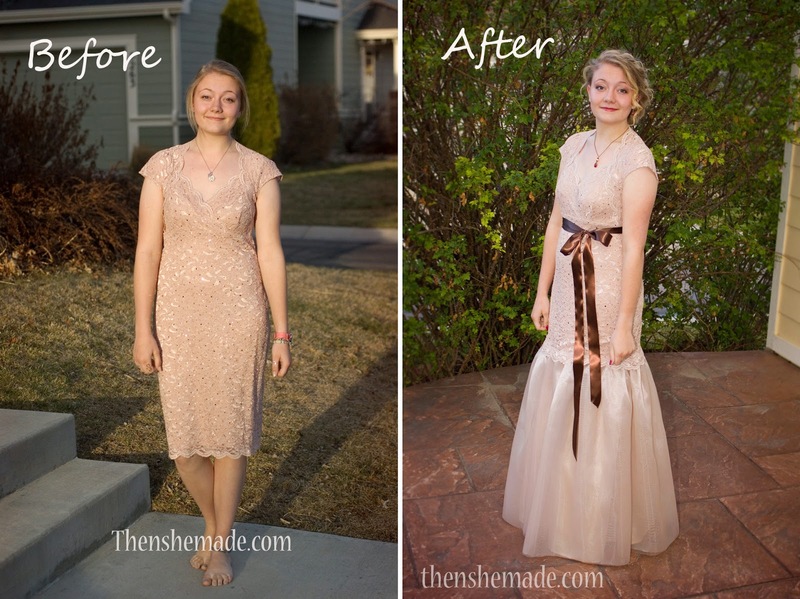 I've posted about dresses we've modified before, usually though, it's on how to make a dress more modest - we have pretty high standards of modesty round here. This time though, we found a beautiful dress that was already modest and Miss M really liked it but she had her heart set on a long dress and this one hit at knee length. Plus, it was pretty but it was missing something. I could see potential though and the $30 price tag had me brainstorming all sorts of ideas on how to improve it. And, I must say, it wasn't too bad or even too difficult. Here's what I did. Here is the dress as purchased. It's just so-so. The photo doesn't really help either as the sun was quite bright, but you can see that it ends at the knee but the top is pretty. It's a classic sweetheart and it was already covering everywhere it needed to cover - love that! The great thing about the dress is that it was actually all some sort of knit, no zippers or difficult fabric to work with. Plus it had two layers, the top which was lace and a liner underneath. You can see the liner peeking out in the photo above. I started with the liner and cut about 5 inches off the hem. This raised the dress to end mid thigh instead of at the knee. Then I started working on adding an under layer that had both length and volume that would attach to the liner. To do this I purchased some stiffer netting, some fabric for another liner and then some fine shiny tulle for the outer layer. Basically I made the bottom portion as another skirt. My first step was to sew the netting section first. I measured the diameter needed and then cut a strip of bias tape to the right length and sewed it into a circle. I then sewed the netting to the tape. I basically made a tiered skirt out of netting. It had two layers with each layer being gathered to add volume needed. 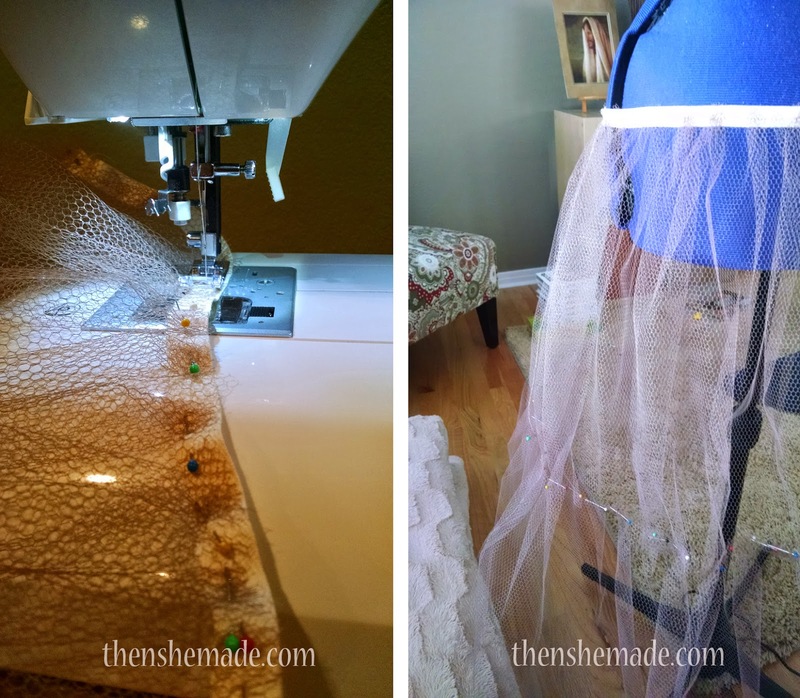 Then, I made a skirt from my lining fabric that went over the netting and then lastly added the softer layer of tulle to the top. All three layers were then attached to the shortened hem line of the original dress. 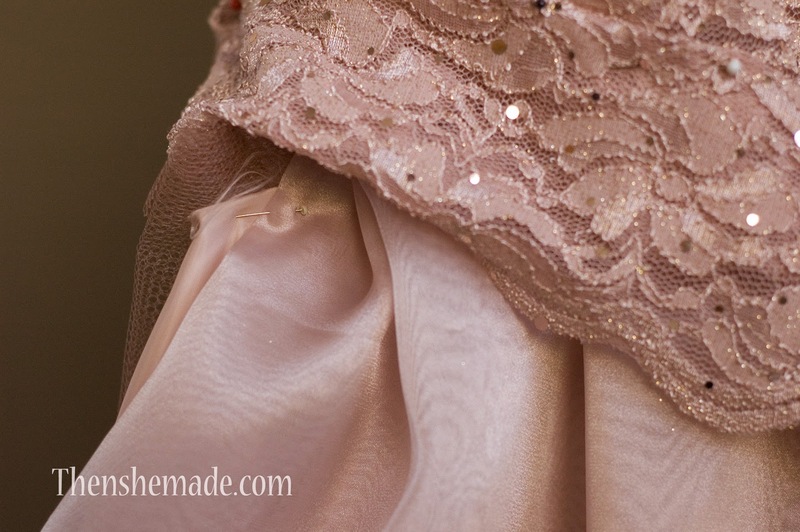 The photo above shows all three layers of the skirt next to the lace overlay. 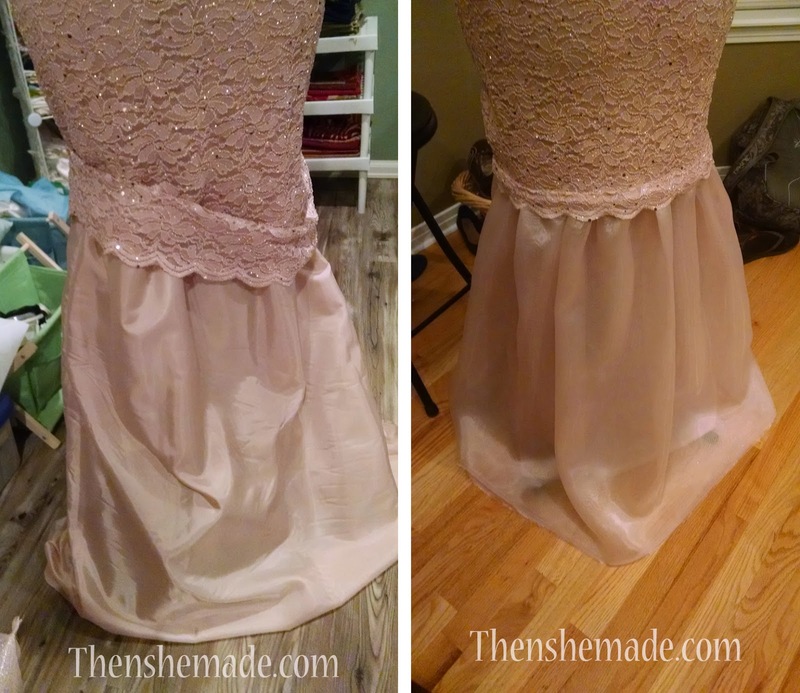 and the last step was to cut the lace top layer of the dress to the right length so that it covered the top of the under skirt and then hemmed it in place. We liked the detail of the scalloped edge of the lace that was on the dress originally so I had to cut a section of the lace out, about 4 inches and then sew the scalloped part back on. I was really happy with how it all turned out. But what made it even better was when Miss M put it on after her hair and make-up was done and she gasped! It was a hands to the mouth in awe gasp and I knew she felt pretty and she loved it. And because of that, it was worth it! 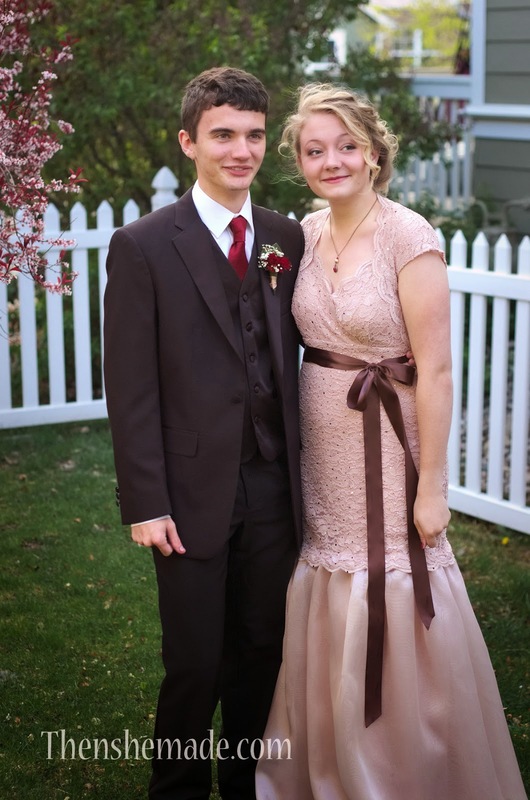 So glad I could help her make her prom memorable. Plus, an added bonus, it didn't break the bank. Dress, additional fabric, & jewelry all came in under $65! 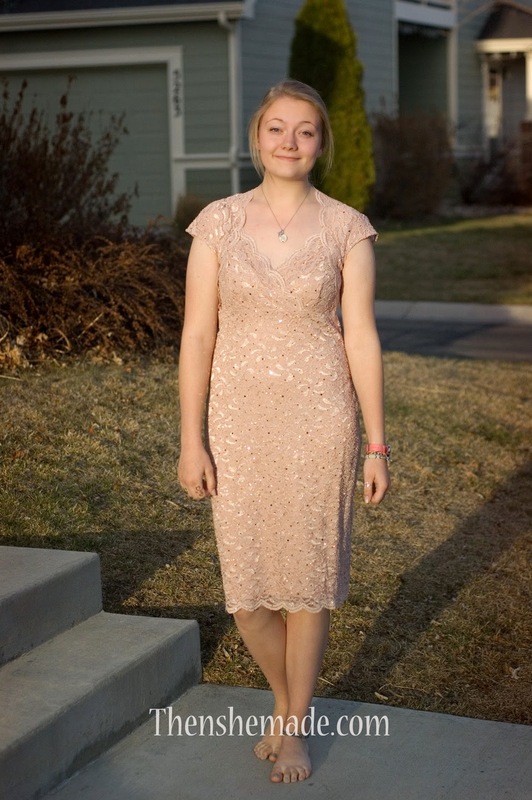 And now I get to do it all again, she's headed to another formal dance in two weeks, guess I better get started! Wish me luck! Wow! That turned out beautiful! 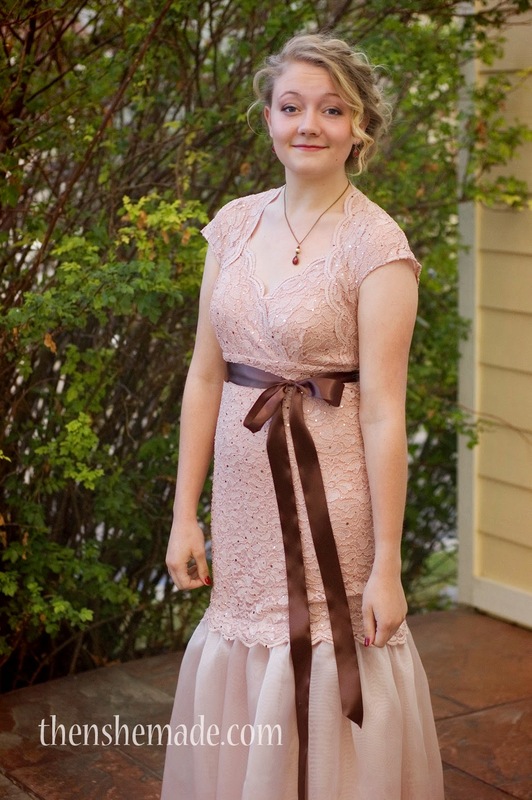 I wish I had a talent to sew, but I am creative in other areas, so I guess it's ok. You daughter looks lovely; I hope that she had a wonderful time! Wow such a beautiful re-creation!! Well done, you. Miss M is beautiful! Turned out wonderfully, such a beautiful girl! !